the cost includes meals in the observatory cafeteria and one night lodging in the observatory dormitory. Yeah, at least we won't have to drive an hour down the mountain after a long night of observing and we can probably get a reserved night there sooner than we can get our Mt Wilson trip back on schedule. But with our luck of being canceled three times now, even Kitt Peak might suffer from one of the haboob sand storms that hit the Phoenix area just when our reservation comes up. Oh well, that is the fate of professional astronomers too when they wait and wait for their time on the big scopes and then weather or equipment trouble causes them to lose their spot and they are put back into the waiting queue. Amateurs have to wait too. I got an email from Telescope Packed Up in the Garage, Frank, who asked if the last week's discussion regarding conjectured relation between quantum entanglement and gravity meant that gravity effects had to also travel faster than light? Hum, lets see. My answer is no. Gravitational effects will not be found to travel faster than light, since that would violate special relativity. But the question is a good one because the way entanglement and even weird quantum effects are described in the popular press is by way of things happening instantaneously. To me, this is not the right way to think about entanglement or other quantum weirdness. Yes, these events are described as happening instantaneously sort of like the "wave function collapses instantaneously", but these descriptions are not included in the mathematical description of the process. I have searched through many quantum textbooks and can find no reference as to how fast the wave function collapses or any such thing. It is just than some interpretations of quantum mechanics describe it as happening that way, but when real physicists calculate what the prediction for some experiment is going to be, they don't include in the calculation any reference to the speed of collapse. So to me, this notion of instantaneous action is just popular explanation and not scientific explanation. I am just a physicist wannabe and definitely could be wrong about this, but I think this is the way to go. I sort of fall into the interpretation favored by Feynmann, who said something like "nobody understands quantum weirdness, so just do the calculations and check the prediction with the experimental results. Quantum mechanics works fine so just shut up and calculate". Anyway this was going to be the week for observing at Black Star Canyon so I was busy finalizing my auto guider camera and interface between the laptop and the telescope mount. Last month or so, as you recall, I tried the auto guider and was able to click on a star in the camera image after which the guiding software was supposed to track that star image and compensate for any error in the telescope mount tracking , which should result in being able to take much longer exposures for images without any visible star trails or such. I just couldn't get the system to control the telescope even though the software tracked the star image as it moved across the sky. Well the problem turned out to be that I misinterpreted what was supposed to happen. Maybe, you say, if I had read the manual a little bit more clearly, I would have noticed this before. 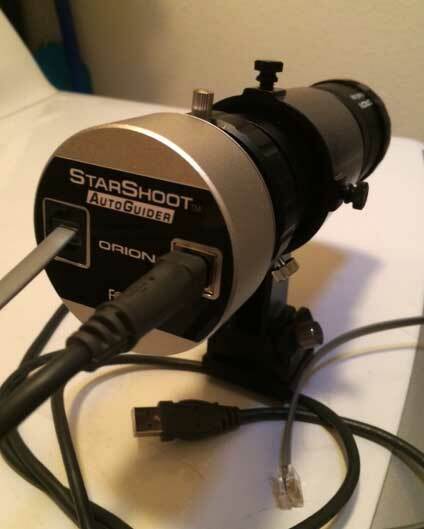 Well, maybe, but look at the first attached photo of my Orion SSAG and note two connection cables, one USB cable goes to the laptop and one RJ-11 connector goes to the autoguider input on the telescope. So, we packed everything up and met Amateurs and Radio Hams, Marty and Bonnie, at Outback for dinner from which it is less than 15 minutes up to Black Star. I was really excited to get set up and finally try to get some good auto guiding work done. Resident Astronomer Peggy had her lounge chair and binoculars and OCA President and Host, Steve, conducted his usual informative sky tour with a laser pointer and we were ready to go. But as luck would have it my excitement was soon dashed by the reality of telescope drive failure. I couldn't control or slew the scope and kept getting "Error 16 and Error 17 and No Response" on the hand controller. I checked on the internet and proceeded to eliminate possible error conditions such as low charge on the battery, missed connections or unaligned connectors and finally just gave up. Using the scope to test auto guiding or any type of motorized target acquisition was just not going to be. Now I spent nearly 20 years doing the engineering and building of very large motor drives and when I retired I thought that my problems with motor drives were over. No, not the case. Now I just have problems with very small motor drives. Wow, now more disappointment and frustration. At least I could check in with other folks and see what they were looking at. I did choose to do a real polar alignment on Polaris, for practice, and even remembered to take on photo of Polaris. See attached. Note how you can easily make out one of the dim companion stars. 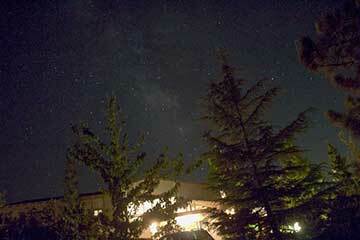 Polaris is actually a multiple star and has several other members that are not visible with amateur scopes. William Herschel first saw the companion star observed here in 1780 as I recall. Wow, as an amateur I'm just getting around to it now 200+ years after it was discovered. Ok, so we packed up and left around 10:30 or so. On the way back, Resident Astronomer Peggy commented on an article she saw in Astronomy magazine that in September, both Jupiter and the Moon will be very close to each other, which should make for a great photo opportunity, but that they would appear very low on the horizon. Oh, oh, we have other rooftops at the observatory that might interfere with the observation. So, I remember checking out a piece of equipment that we could use to get good views over the roof tops. Check out the photo of the scissor lift found at Lowes. I'm not sure what our housing association would say if we tried to bring this home with us, but hey it would have got up above the rooftops. Ok, ok, that is enough of that. Now, I have to go through the trauma of waiting for Celestron repair of my AVX mount motor drives. I've seen terrible comments about the service. I have not been impressed with the one time I tried to get some help. Now, I really need some help to get the mount repaired. So, I'll be sitting out on using my Explore Scientific scope for a while, but will get out with just the 600 mm telephoto lens on the light weight ioptron Alt/Az mount. So, that is it for now. We will miss the Julian Star Festival this year too, because we previously signed up for Pageant of the Masters theater night at the same time. Darn, sometimes it seems like we are just too busy. Next week, we do have an upcoming tour of the Big Bear Solar Observatory, and a night in the mountains which should be nice. I hope that tour does not get clouded out or whatever else might happen.